news on Rankin was recently recognised as a STAR Workplace as part of the national HR Coach STAR Workplace Program. Pamela Dickerson of hr2go vital people facilitated the survey based process with the business. 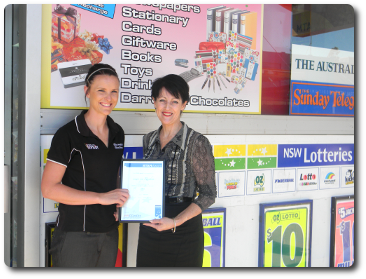 On presenting the Certificate and Report results to Gabrielle Miller, the dynamic business owner, Pamela highlighted the success that the business had achieved. News on Rankin decided to undertake the Star Workplace program as a means of improving attraction and retention of staff and to ensure that, as business owners, they were aware of any areas for improvement. Owner, Gabrielle Miller enthused, “I am incredibly proud of my business and the fantastic team working with me. Going through this process has been important as it helps reinforce the things we are doing well but also highlights areas for improvement. My team and I now have a clear picture of what we need and want to focus on for the next 12 months. Being recognised as a STAR Workplace now means that I can show my team and my clients that we are committed to creating an amazing business”. The HR Coach STAR Workplace Program is a national initiative to recognise businesses that have an engaged workforce and empowered team, including the business owner. The program was developed after years of research by the HR Coach Research Institute into the link between Strategy and Action in small to medium sized businesses. One of the outcomes of this research was the link between Employer and Employee Satisfaction on the businesses ability to achieve its strategic goals. The STAR Workplace Program measures key areas of the business and provides a framework for future planning as well as valuable recognition for the business.